Well done Mike. Good to hear she flew well - can't seem to view your engine test video. What is you final weight? Mine has turned out at 15.4 pounds including nose weight, which I am a bit worried about. Mike that looks great, well done! How many degrees of flaps did you use Mike, or alternatively how many mm down is the trailing edge adjacent to the fuselage? I've searched high and low and can't find any recommendations. With the weather cooled down a bit, I might get up the courage to maiden mine this weekend. Well done Mike. You may now remove the bicycle clips. Allan, Apologies for teaching you to such eggs, but If its anything like my BH Mossie (and Mike mentions it specifically) with flaps half way it becomes very draggy. Full flap and it has to be flown in over 1/4 throttle or it will tip stall. Better a fast landing or very low pass than tip stalling with full flap at 15 ft (been there had that ). Let me know if you want the BH & Seagull flap settings. Thanks Mike, I've got mine on a 2-position switch, with the servos programmed to run at 10% speed. Like you, I don't know what my actual measurement is until I assemble the model again, but I do know my full-flaps is as far as they would go without binding. But how far that actually is depends on the accuracy of my build. 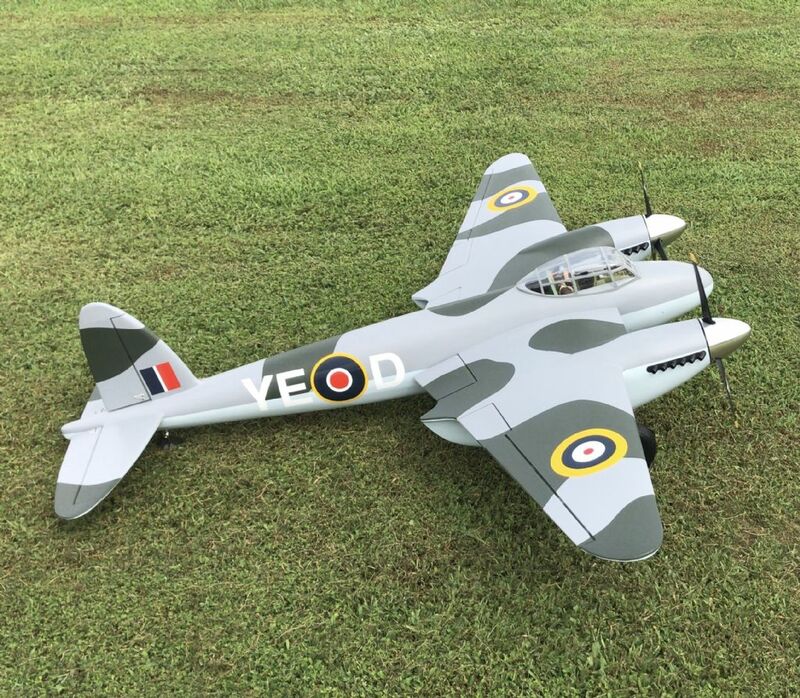 I've just now checked the internet for images of Mossies with flaps deployed, and I've found two that seem to show a larger angle than mine can achieve, so at least I won't over-do it I'll try and get some sensible angles off the photos, and see how they compare when I assemble mine next time. Chris, thanks for the tip. I'm very comfortable with power-on fast landings! I also measured my BH mossie and that comes out 15 and 25 degrees (where 15 is quite aggressive and 25 seems like air brake territory. Worth watching Eric "winkle" Brown's comments on carrier landings **LINK** as I don't think we really want to get into 4 blades and "hanging it on the props". Just amazing what he did with a 21,000lbs aircraft. I'll measure the Seagull mossie and see what looks right + I might know man that will know the full size settings (just for interest!). Something I am about to try is having flaps extended fairly slowly (1.5 sec) but retracted at full speed on touchdown because I find that they cause my Hurries and Spit to nose over. If using full flap for landing you certainly need to keep a lot of power on so a dead stick means no flaps. I use the following technique which seems to work for a foam P51 up to my BH Mossie. Increase the elevator travel and put a load of expo in, that way 99% of the time you never get close to full TX stick travel and just as you are on the final roll (just before it noses over!) you can give it full up to hold the tail down..
Alternatively I find if you can hold a bit of motor on to maintain some wash over the control surfaces (elevator), but its tricky as you are heading towards the hedge to keep your bottle! Retracting flaps will reduce the lift, but will also reduce the drag, so good news it will stay down, bad news it will roll further. I have my flaps on a 3 position switch so up, 1/2 and full, if I was only using up or down I would go for 1/2 setting as 45 degrees on the PZ mossie is a real handful and if I am not careful I end up dumping it down. Full size Mosquitos maximum flap deflection is 45 degrees (on all variants) from two very reliable sources. The pilots notes for NF38's prepared by the Air Ministry also mentions 1/3 setting (of the 45 degrees) for take off. Interestingly on a miss landing/going around again they state "open throttles, raise U/C and set flaps to 1/3. Climb at 120 knots, increase to 150 and at safe height raise flaps fully. marked F to the right of the undercarriage selector lever. flap angle is 45° although the gauge is marked up to 70°. It also states flaps up or 15 deg for takeoff and up to 45deg for landing. Thank you for that wonderful research, and for reports of other models. I haven't got space to assemble mine at the moment, so can't do any proper measurements, but my feeling is that I've got more like 15 degrees and 30 degrees for my '1/2' and 'full' positions. Sounds like that'll be effective enough, but safe. Measured the Seagull and maximum deflection is 50 degrees against the stops! So could easily achieve the standard 45 degrees. As my BH has 15 and 25 degrees I am going to go with that on the Seagull. I will fly mine in on 15 degrees and if it coming in really fast then go to full flaps down for me at 25. The BH is light and flaps 15 has a nice "feel", but flaps 25 seems "aggressive" a very close second to the PZ mossie at 45 degrees. This is just my personal preference and yes more flap will give a bit more lift (at 30 degrees) and loads of drag at 45 degrees, but the price paid is that most of that is generated off the props. The PZ mossie reacts significantly to throttle changes made much worse by the high flap setting which is okay if you are used to it (I only experience it for a few seconds while trying to land) and its really easy to dump it down. Less of an issue with a larger/heavier model, but here comes my point. If you are at flap 25 or 30 degrees and it all goes pear shaped....too high... too fast or too long down the runway best option is power up and go around. For take off its no or flap 15 degrees for the full size, now you can probably get away with flap 30, but a go around at flap 45! That's going to close to full power to gain height and speed, not a good time to be testing everything at flat out be it electric or IC in my book. A pilot once spoke about not pushing a bad decision, and I take that one step further with trying to make sure you don't get to the bad decision in the first place and if you do... have a plan. Your point about a go-around is a good one Chris. I've got my Hitec flap servos programmed for slow speed so that I don't get an abrupt change of attitude, but at the moment that would prevent me from going quickly from, say 30 degrees, to 15 degrees for a go around. But is it really a problem? The only time I can think that I've had to go around is when I'm obviously coming in much too high, so that gives me time, so long as I don't panic, to raise the flaps before trying to gain height, or turn, for the go around. Too fast is not an issue for me -- it makes the model more controllable, though the walk to retrieve it is that much longer, assuming I can't turn it and taxi back because of long grass. In a long about way I was agreeing with you with flaps set for 30 ish degrees as it leaves you with the option of going around or further down the runway (not an option for me), I think and the PZ mossie with 45 seems to confirm that its a very aggressive setting and perhaps best practiced when you really know the model well. I again agree with the slow flap transition as it can be a bit off putting with the change in pitch, I try to select gear and flaps 1/2 at the same time with the BH mossie thus hardly any change in pitch although a noticeable increase in drag (to be expected). Just an observation, on my flap equipped models I have set to drop slowly but raise quickly, this gets over the ‘quick, let’s go round again’ problem.